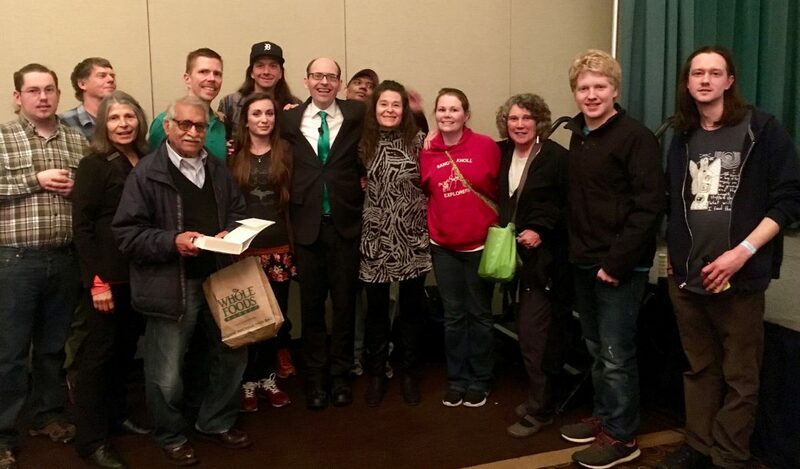 Eleven members of Northern Vegans and Copper Country Vegans and two downstate friends participated in the largest single day vegan festival in the U.S. held in Novi, Michigan on April 30th. Over 5,000 people packed the Suburban Collection Showplace for the 18th annual MI VegFest. The energy, new information, inspiration, and opportunity to be surrounded by people of like-mind makes MI VegFest something to look forward to each year. Dr. Michael Gregor of NutritionFacts.org and Wayne Pacelle of the Humane Society of the United States brought down the house with their presentations about health and animal welfare respectively. The exhibit hall was packed with 60+ food vendors and 100 businesses all showcasing their vegan good and services. Hopefully, there will be even more Yoopers who make the trip next year. Below are comments from those of us who attended this incredible event.